Calibration tool box in the palm of your hand! 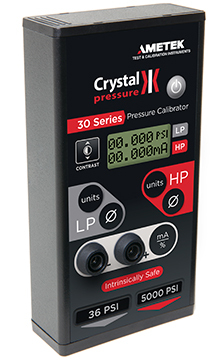 The 30 Series is a wide range digital pressure calibrator that fits easily into your shirt pocket. Its internal sensors give you 0.05% of reading accuracy and resist damage from overpressure. -SPSS Stainless Steel Manifolds – All high pressure sensors come with a stainless steel manifold. Some applications require that the second sensor be stainless steel as well. CrystalCare Crystal Care Program (US and Canada customers only) – A 3-year full warranty program covering virtually any failure and an annual A2LA accredited calibration certificate with test data recorded at 5 different temperatures – proving that it meets published specifications over the entire operating range. B Absolute Pressure – Available for gauges rated at 2000 psi or higher. Add a B to the units to designate the absolute version (for example 2KPSIBXP2I). 2490 Soft Carrying Case (included) – The clear plastic cover protects the keypad while allowing operation of all buttons. FastCalXP – Calibration software that allows you to do a 10 point up and down calibration in less than 3 minutes.